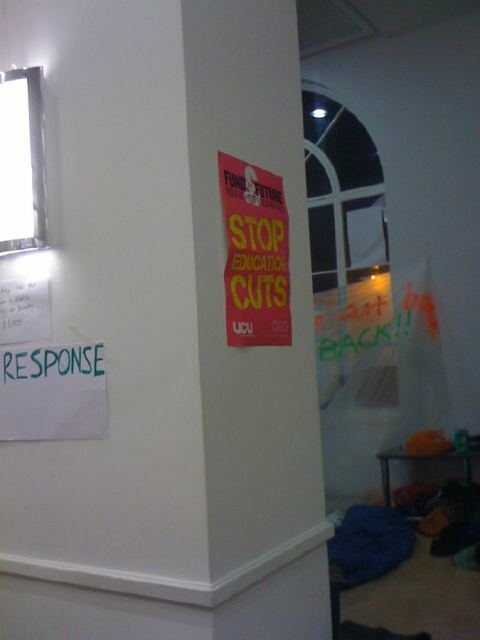 UCL Occupation unconditionally condemns the police attempts to pre-emptively kettle a peaceful protest. 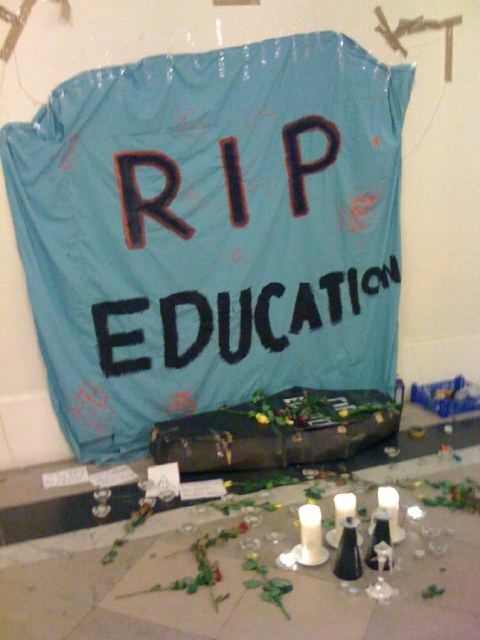 Students gathered in Trafalgar Square for a protest agreed by police, including many involved in the UCL Occupation. Less than ten minutes later, before the march had begun, police began moves to kettle protesters. This understandably caused chaos as students fled to avoid being held in the cold for an indeterminate length of time. We have received reports from our students of aggressive over-policing including the Territorial Support Group chasing protesters down the Mall. One UCL student is reported to have been rugby tackled by police into railings near Westminster Abbey. There have also been reports of police being armed with CS Spray. It is a sad day for democracy in the UK when students who accommodated every police requirement and were given permission to march are treated like criminals, with no provocation. We lay the blame for any disruption, distress or injury squarely at the feet of the police. The lights in the Jeremy Bentham room, University College London, go up at 08.00am, a tidying spree starts collecting last nights junk, not least the orange cuttings used by activists to flash mob a Topshop in Oxford Street yesterday. The snow falls down outside, on the day of the biggest student protest for many years; outside is bitterly cold and activists are being briefed on, among other things, the history and legalities of kettling. Part of the briefing focuses on Section 50 of the Police Reform Act 2002, where a police constable reasonably believes you are committing anti-social behaviour, harassment, alarm or distress, at which point an individual can be asked to hand over his or her name and address. Psychologically, the legal expert stresses, this and other police tactics may instil fear within someone wishing to take part in further protest action. To look at this psychologically is very important; a tactic based upon instilling fear, which kettling may be perceived as, is very close to deterring people’s right to free expression and protest. The people in the room know this, resilience and determination to overcome these tactics are based upon how urgent the issue is. Amusingly the legal expert reminds us of the need for a good test case for objecting to hand over names and addresses when slapped with a section 50; the unwilling case studies could be in the room. The “triple whammy” of higher fees, real interest rates for loans and a longer period before the debt is written off is likely to represent a bad deal for taxpayers, argues million+, a university lobby group. The changes will leave between 60% and 65% of graduates worse off, with middle-income earners hit the hardest, it says. All rise the squeezed middle. The charge that these fee changes are progressive fail to miss the mark again, and the argument that increased university interest legitimates sky high fee increases, thereby disincentivising students from poorer backgrounds, fails to hold sway with many young people today – many of whom will brave the adverse conditions and show the government what they really think (apart from David Cameron, who today travels to sunny Zurich to lobby for England’s World Cup bid). Creators of the Facebook Group Students in Favour of Tuition Fee Reform quote changes under reforms such as increased repayment threshold from £15,000 to £21,000, though the feeling in this room is that education is a right not a privilege – and indeed should not be the preserve of the privileged. University standards must be reserved for a different, though very important, debate. If the argument is made that there are an unsustainable amount of people wanting to continue their education in university (which I haven’t heard yet) then the way to address that is not bandying arbitrary rates, making it impossible for sways of students to follow their chosen path – yet according to Nick Clegg, in his letter to Aaron Porter, this is fair. In spite of the cold, I look forward to seeing a response to this claim in London today. For some time, Aaron Porter’s “dithering” was the bane of students’ life. Here in the Jeremy Bentham room, University College London, his lateness to come out in support of peaceful occupations wound activists up to the point of hair loss. His tweet explaining a U-turn, now supporting such occupations, was met with near jubilation, though it was not without cautious reservation. Now it turns out this reservation was correct; he has changed his mind back, allowing Judy Friedberg to wonder whether we can expect another makeover next week. 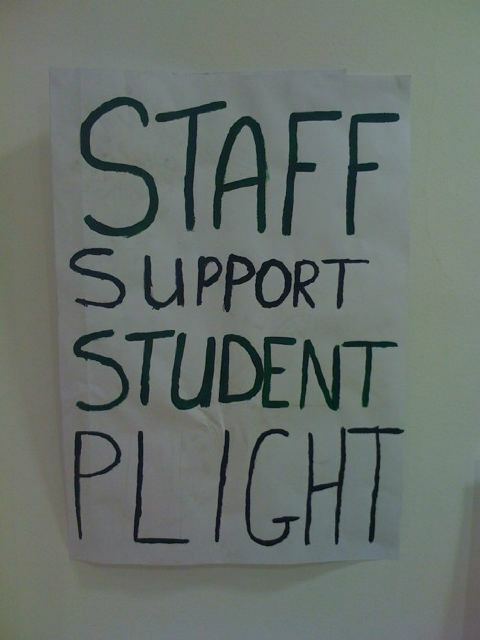 The contentious issue surrounds whether an individual student is legally covered by the NUS, and since direct action by students is the order of the day to see demands met, in an environment where it seems voices are not being heard, the flip flopping by the union is not just annoying, but dangerous. The question remains: should Aaron Porter face a Vote of No Confidence in his presidency over his handling of NUS support for the national student walk-outs? The highest order of our student representation is back to dithering, but all is not lost today; in addition to the petition against fee rises by 104 failed LibDem candidates for parliamentary seats, Jennifer Willott, MP for Cardiff Central, has resigned from her party over the issue. Her page on They Work For You mentions that her priorities in parliament were local health services, tuition and top-up fees, and council tax. She’s not alone in the party who campaigned on a similar platform, this could be the necessary event that could arouse further resignations and more vocal rebels inside the party. While government splits take real traction, our student representatives forget whose side they’re on – with further leadership pettifoggerywe take one step forward, and two back. Another busy day lies ahead for the students and activists occupying the Jeremy Bentham room in the University College London. Following on from plans to leaflet central London to reach wider audiences and hold meetings with security staff to achieve mutual agreements, a press release has just finished with Channel 4, CNN, Radio 1 and many others in attendance. News that the NUS have “u-turned” on their official position towards occupations takes precedence during the meeting with the press, in addition to the planned march on Tuesday by the students, which the media have taken huge interest in. There are plenty of articles focusing on the dithering of Aaron Porter, and his late in the day decision to support, in his words, “all peaceful student occupations. We need to keep up the fight! Visiting @UCLOccupation tomorrow.” The national campaign against fees and cuts reminds its readers that the occupation is one such example of peaceful occupation, while Libcom have noted that Porter’s apology fits his agenda. Luna 17 mock him for his umming and ahhing, though the Whitechapel Anarchist Group go all out and all call him a “wanker”. The Science based nutrition blog informs its readers that the Browne report does not consider the whole picture, looking only at how to fund universities now, and not considering what universities should be – institutions of learning and not necessarily extensions of work experience. 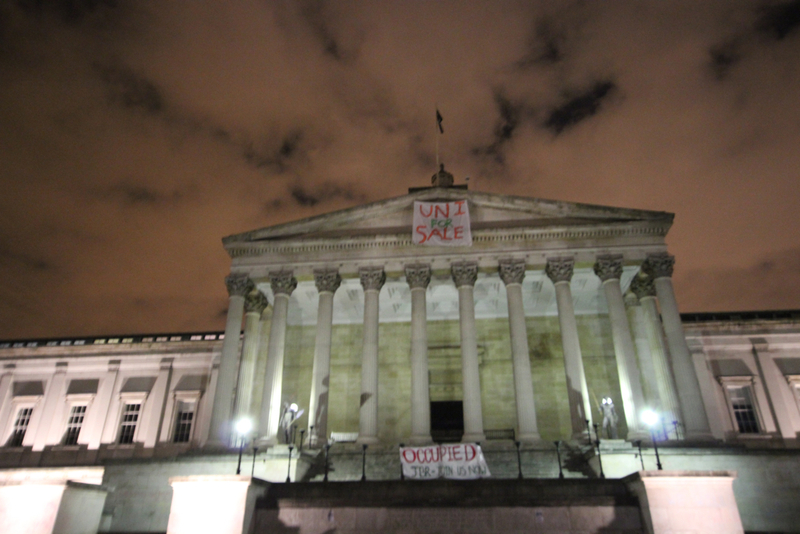 The UCL Occupation has a new website live called UCL Occupation which will stream the days events, host blog entries, show lectures and other occurrences that take place during the occupation of the room. The wry protest songs, satirical posters and occasional smiles on the faces of students involved in the occupation of UCL, Jeremy Bentham room, does not take away from the fact that the room is a place of constant work, intense planning, sporadic meetings and tweeting (something which Channel 4 have now congratulated the occupiers on). One moment there is an English Literature lecturer admitting his flaws as a protestor and his dislike of filmic depictions of Maoists, and then even before you have time to put on a second jumper in the bitter cold, a group has formulated to discuss the next way of attracting media attention and capturing the hearts and minds of the public. A call is made for Lib Dem members to raise their hands in order to get hold of local contact details, of activists who perhaps feel betrayed by their ministerial representatives, but nobody raises their hand. When I was at university, every left wing protest that took place, be that opposition to fees (somewhat cheaper then than they are now, but no less disgraceful) or the Iraq war, was overrepresented by yellow banners. Now, signatories opposing fee increases such as Nick Clegg are the figures of mockery – and for good reason. This a sign of things to come. Later on tonight there will be comedy provided by Mark Thomas and Chris Coltrane, but as that takes place banners will be created, and pasta made for hungry revolters. The lights will dim and the cans of cheap booze will come out, Jaffa cakes will be passed around and hashtags will be created, but all the time people congregate to ensure leaflets are created to hand out in the week, that Parliamentary offices are contacted, press releases are sent out on time and solicitor support numbers are added to. While there is room for Dionysus, it is married with work unparallelled in many campaign offices – and more makeshift beds than I’ve ever seen. Michael Sayeau who is just finishing up a talk mentions how unique it is walking into the room and seeing laptops on the tables; it is the level of communication that is keeping this occupation successful, the action finally has the support of Aaron Porter (who did quite enough dithering, but decided he supports all non-violent protest) and praise is increasing from the pens of journalists. But the work is unceasing, in fact the positivity creates motivation for the activists. Tomorrow is another day, and the efforts are really paying off. Christopher Hitchens versus Tony Blair: Is religion a force for good? 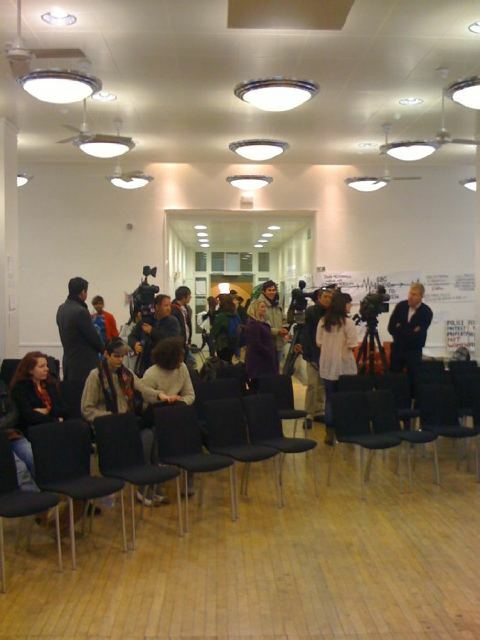 The scene was Toronto, Canada, where atheist and anti-theist Christopher Hitchens came to debate former British Prime Minister Tony Blair on the resolution “religion is a force for good”. Munk debates – who organised the event – saw all 2,600 tickets sell out soon after the ticket office opened, while CBC news in Canada claim that “scalpers outside were asking for as much as $500 a ticket. Inside, the compere and the chair of the debate both felt inclined to remind the audience that Christopher Hitchens has recently been diagnosed with cancer which he battles with today, yet this has not put stop to his intellectual output, as tonight’s debate seems to testify. At the start of the debate, the crowd were asked to offer their own opinions of the resolution in a poll. The pre-debate results came in at: 22% for the resolution, 57% against and 21% undecided. Hitchens started the debate by mentioning Cardinal Newman, assuring the crowd that his opposition to the resolution doesn’t just pick on the extreme elements of religion, or so-called extreme elements, but rather the false hope of the moderate voice as well – a theological position which, to Hitchens, is just as damaging and preposterous, but which is given legitimacy. Not to forget the fanatic side, Hitchens asked the audience to think what will happen if fanatics take hold of apocalyptic weaponry – before explaining that in the Middle East this is already a reality. In Blair’s reply to his opponents’ opening statement, he told the audience that a quarter of the work done on HIV/AIDS in Africa is carried out by Catholic organisations. Faith, for Blair, is not just a means of counsel to people, but it is a spiritual experience, which rather than sits separate to science, actually contextualises it. In reply to Hitchens on fanatics, Blair reminded him that it is not just religion that produces evil, pontificating on Pol Pot and Stalin. After setting out their statements, the argument seemed to rest on whether religion can be a necessary source of inspiration for people who carry out good, in the name of the faith – something the Tony Blair Faith Foundation is keen to promote, in addition to promoting interfaith discussion and resolution – or whether what we choose to describe as religious inspiration is simply common humanism which is an appeal to kindness that all people share, religious or not. As this notion became the centre of the debate, Hitchens was able to set the narrative, leaving Blair to try and find examples where faith is the main driver of good. The former PM, being reduced to admit that people have the capability of good, religious or not – which would seem obvious – it allowed Hitchens to assert that faith is not necessarily a force for good, since it is as likely that someone with faith can be as good as someone without it, leaving Blair to pursue the rather flimsy counter-argument that faith can be some source of inspiration for those who do good in its name – a position which does little to undermine Hitchens’ own. The most memorable line of the night came from Hitchens who said that “the cure for poverty has a name: the empowerment of women” which while Blair did not disagree, left him in the position of distancing himself from bigoted opinions inside the church. The two debaters concluded in disagreeing the qualities of faith and religion, Hitchens opining that it should be enough to want to help others without recourse to a “theocratic dictator” while Blair assumed that love and humanism for other people can be legitimately bound in religion, which is no bad thing. The audience had the opportunity to vote on the resolution after the debate, to see whether they had changed their mind (which 75% of them had said before the debate they were open to do); 68% of the votes ended up backing Hitchens, while 32% backed Blair – which means a swing of nearly 10% for both men. The question remains; religion and faith are not always bad for the world, prejudice and intolerance can be carried out by anyone of any theological position or none. But does it necessarily follow that religion is a force for good? A crowd in Toronto has said no.